S. Sampath, R. Rementeria, X. Huang, J. D. Poplawsky, C. Garcia-Mateo, F. G. Caballero, R. Janisch. 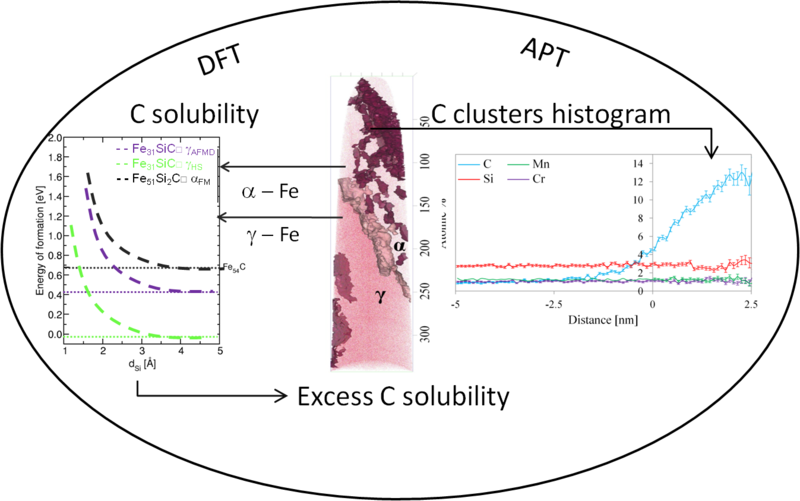 We compare the results of ab-initio calculations of carbon solubility with atom probe data to understand the influence of Si on the segregation of C in bainitic ferrite. Graphical abstract of Sampath et al.,Journal of Alloys and Compounds 673, 289-294, 2016, reprinted with permission from Elsevier. We investigated the phenomenon of carbon supersaturation and carbon clustering in bainitic ferrite with atom probe tomography (APT) and ab-initio density functional theory (DFT) calculations. The experimental results show a homogeneous distribution of silicon in the microstructure, which contains both ferrite and retained austenite. This distribution is mimicked well by the computational approach. In addition, an accumulation of C in certain regions of the bainitic ferrite with C concentrations up to 13 at % is observed. Based on the DFT results, these clusters are explained as strained, tetragonal regions in the ferritic bainite, in which the solution enthalpy of C can reach large, negative values. It seems that Si itself only has a minor influence on this phenomenon.